Lisa Taylor was raised just outside of Washington, D.C. and bottle fed on the music of the seventies –Carole King, B.J. Thomas, Rare Earth, Three Dog Night, The Carpenters, Simon and Garfunkel, Crosby, Stills and Nash, The Supremes, Aretha, Donna Summer - and all of the show tunes from the 40’s through the 70’s. She was the youngest of three born to musically gifted parents. Her father was a Navy percussionist, dance band drummer and acoustic guitarist and her mother was a stunning vocalist and organist. Lisa played guitar, clarinet and demonstrated near perfect pitch as well as song crafting before the age of ten. By the age of 14 she had taught herself set drums so she could join her sister’s rock and roll band. Lisa and her sister Dana formed several bands, the most notable of which was “Sister”- a rock and roll- big- hair- band. Lisa’s formidable drumming and distinct vocal harmonies made “Sister” one of the most sought after female rock and roll bands of the Mid-Atlantic Area from the early 80s into the mid 90s. 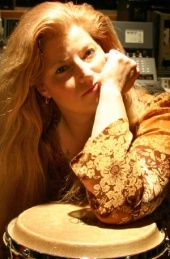 While earning her master's degree in Social Work Lisa received several Mid Atlantic Songwriter Awards. In 1995, while in the midst of recording her first solo album, Lisa was honored as a finalist in the prestigious Kerrville New Folk Competition. Her album “Sibling Rivalry”, co-produced with Matt Holsen at ESM Studios 1996, received considerable critical acclaim and seven Washington Area Music Association nominations. It is currently in its third pressing. Ever fond of drums and percussion, Lisa joined a short tour with her sister’s Jazz Orchestra in France and continued to work with a variety of local songwriters, performers and bands earning her the 1997 Rock/Pop Instrumentalist of the Year award from the Washington Area Music Association. In 1998, Lisa and her husband had their first daughter Halle. Lisa continued to engage in music through studio sessions with an ever growing list of local and semi-national artists. These vocal and percussion contributions have been aired on episodes of “The Osborne’s” “Felicity”, “Starting Over” and MTV’s “The Newlyweds” and on films such as Serving Sara, Backflash, Devious Beings, Eve’s Christmas and A Boyfriend for Christmas.